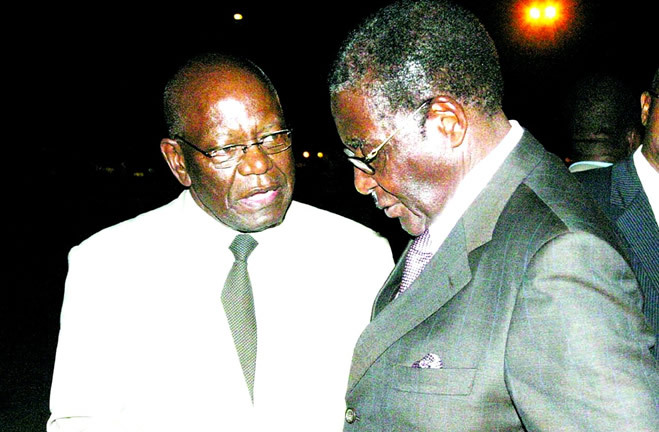 FORMER intelligence minister Didymus Mutasa has revealed for the first time that the MDC-T actually won the 2008 election by a narrow margin. Mutasa told the South African Sunday Independent newspaper that Zanu PF people were so shocked by the result that he, as security minister, rushed to protect President Robert Mugabe at the State House. The former Zanu PF secretary for administration added that they were “absolutely shocked” and had Morgan Tsvangirai decided to claim his victory by marching to Mugabe’s residence he would have taken over and with ease. He said: “I immediately drove, at speed and alone, from my home in Rusape, to State House in Harare. Tsvangirai’s flight to Botswana in 2008 has also been criticised by senior researchers and analysts. In his article titled The Tragedy of Tsvangirai, Professor Stephen Chan, who observed the 2008 elections, also suggested that the MDC-T leader’s decision to escape to Botswana may have been a blunder. According to Chan, Tsvangirai was advised by the US embassy to do so because it was felt that indeed there was a plan to assassinate him. Tsvangirai was to pull out of the rerun after Zanu PF unleashed a wave of violence against the electorate making the poll one of the most violent elections in the history of the country. Mutasa added: “I don’t know how much cheating there was in elections, but I do know that in 2013 (finance minister) Patrick Chinamasa cheated to win. He bussed people in (to vote for him.) I protested to him and to the Zimbabwe Election Commission. According to the paper, Mutasa said he “regularly chaired” the Joint Operations Command which meets once a week to discuss pressing state security matters. “We discussed many things, such as violence. How to stop it. If food was short we talked about how to find it, usually from South Africa. The joint command did produce top- secret documents every week. “Secrecy still binds me, from when I was minister. But of course you know that some waiters in hotels work for the CIO. Your phones are listened to a lot. The CIO is huge. Mutasa, who is now guarded by private security after he was fired from government and Zanu PF, admits that he is now aware that his former party is violent. “Zimbabwe has become a miserable place. I say this about the state, my country,” Mutasa said. “Now everybody is broke. The economy is broke, mining, agriculture, and we should have done something about that 10 years ago. According to the report, Mutasa denied any knowledge of specific events such as the May 2008 murder of Tonderai Ndira, one of the MDC-T activists. On the 1980s Gukurahundi genocide he said: “I did not know about Gukurahundi as I was Speaker of Parliament in Harare for the first 10 years of independence. “We didn’t speak about it in parliament. No one told me about it. I would only know about violence if I read it in the newspapers,” Mutasa said. The 80 year old Mutasa also disdains VP Emmerson Mnangagwa who is widely seen as the engineer of the demise of the Mujuru faction to which Mutasa belongs.